There are more movie review websites on the internet than pubs in Ireland, and in this reviewer's opinion only a fraction of these have any merit whatsoever. (I'm referring to the websites; the pubs are all great.) By far one of the most original, informative and entertaining is Bryce Zabel's MOVIE SMACKDOWN. Yours truly has been recently invited to participate as a Guest Critic and what follows is my first submission. If you enjoy Smackdown's premise and format as much as I do, then I enourage you to check in regularly at www.moviesmackdown.com. THE SMACKDOWN. Don't underestimate the impact of a little cloud coming over the horizon -- and I don't mean the mushroom variety. You see, some types of ground-hugging hazy vapors possess evil things which brutally attack isolated villages and wreak more havoc than this year's BCS situation. I know, I've seen several films dealing with this concept and they make me think twice about venturing out when the sun ain't shining. 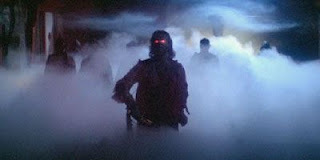 Written by John Carpenter and Debra Hill, "The Fog" is a terrific example and may very well be the gold standard of this sub-genre. 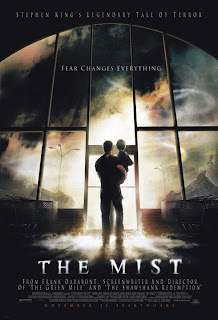 We now welcome John Darabont's "The Mist," based on a novella by none other than Stephen King. Two heavyweight directors tackle the same basic precipitation premise. Is "Mist" simply "Fog Lite," or does it weather the storm of this writer's criticism? THE CHALLENGER. In the opening scenes of "The Mist" a violent storm passes through a small village in Maine (with Stephen King where else would it be?). As the townsfolk begin to clean up and attempt to make repairs, an approaching cloud of mist appears and slowly engulfs the entire community. Those inside the Food House supermarket are soon warned that "There is something in the mist!" by a frightened neighbor who seeks refuge inside. Actually, there are a lot of things in the mist including intestine-devouring creepy crawlers, killer spiders who can shoot their poisonous webs farther than you can spit a watermelon seed, gigantic deadly mosquitoes (for lack of a better description) which make the Houston variety seem impotent, scores of what look like Zanti Misfits (or should I say Mistfits?) and multi-tentacled giant arachnids who have a propensity to probe where we wish they wouldn't. Scary stuff, indeed, but none of these creatures of destruction equal the horror of the Bible-spewing, supercalifragilisticexpiationdoses-demanding Marcia Gay Harden who proves that true evil is not lurking outside in the parking lot but within the souls of those huddled inside. It helps that the entire ensemble cast is quite good and you can rest assured that the overall graphic horror quotient will satisfy even the most blood-thirsty cineaste. And while I won't give away the ending, let me simply say it was a bold and unexpected one that will leave some viewers shaken as the end credits begin to crawl. THE DEFENDING CHAMPION. "The Fog" is a traditional zombie film with an outstanding cast. Adrienne Barbeau, in perhaps her best film role, is accompanied by the real-life mother-daughter team of Janet Leigh and Jamie Lee Curtis as well as John Houseman and Hal Holbrook. It is the inimitable Mr. Houseman who sets the stage by telling an old ghost story by a camp fire on the beach of a seaside community about to celebrate its centennial. Apparently one hundred years earlier the town's founders set a fire to lure a sailing vessel to the rocks and a watery grave for all aboard, including the lepers who intended to land nearby to establish their own settlement. Legend has it that "When the fog returns to Antonio Bay, the men at the bottom of the sea will rise up and search for the campfire that led them to their dark and icy death." The legend was dead on. At first only weird things happen; clocks stop, electronic devices go haywire, glass shatters, etc., but then the faceless killing shadows of the resurrected emerge from the ethereal fog that overtakes the town and the revenge begins. Unlike Mr. Darabont, Mr. Carpenter relies far more on atmosphere (pun intended) than graphic visuals to frighten the audience. In fact, most of the horror is left to the viewer's imagination and not to the special effects gurus. THE SCORECARD. Let's start with the title. Clearly "The Fog" is superior to "The Mist." For God's sake, what's next? "The Haze" or "The Condensation" -- how condescending would that be? Points also go to "The Fog" for a superior cast. Sometimes a film can really benefit by having relatively unknown actors throughout, but a typical genre piece, or in this case a sub-genre film, generally benefits by having a recognized cast assuming they are right for the part. Who better than John Houseman to be the storyteller? Who better than Hal Holbrook to play the priest? Who better than Adrienne Barbeau to play the buxom heroine, at least back in 1980? "The Mist" is a more ambitious film on several levels. It is far more dependent on special effects and for the most part the CGI creatures are reasonably good. And points will always be won when the Zanti Misfits are given a homage; it's like having a cameo appearance by Kukla, Fran and Ollie, you just can't go wrong. (That's my opinion and I'm sticking to it.) 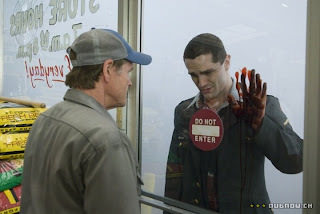 Whereas "The Fog" is simply a straightforward suspense/horror film, "The Mist" delves into a post-9/11 political allegory at times as it explores mob dynamics and religious fervor. That's quite an undertaking. You almost want to drink Kool-Aid rather than a Coke to wash down the popcorn. THE DECISION. 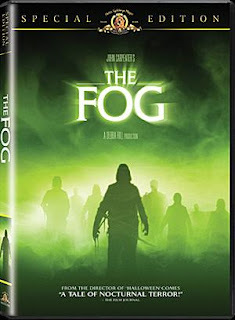 While both films are worth seeing, the clear edge must go to "The Fog." It achieves precisely what it sets out to do by delivering an entertaining, stylish suspense/horror story that works on all levels, despite a relatively small budget. That's what true talent can deliver, and while one may argue that "The Fog" isn't John Carpenter's best film, it certainly holds up very well after twenty-five plus years. I don't believe the same will be said of "The Mist" in the year 2025. "Plunk your magic twanger, foggy!"